1 Lullaby This was written as a string quartet exercise sometime between 1919 and 1920, but was unfinished. The theme appears in George’s early opera ‘Blue Monday’. This is my version. 2 Do It Again (1922) This song was composed in 1922 for saucy French songstress, Irene Bordoni. Here we have George’s ‘Songbook’ arrangement from 1932; one chorus is too short, so I have repeated it. 3 Irish Waltz Also known as ‘Three Quarter Blues’, this piece was written in the early 1920s. 4 Rubato (1923) This piece was an early Prelude. 5 Theme from ‘Rhapsody in Blue’ (1924) George recorded the Theme from his Rhapsody in London on June 8, 1928. 6 The Man I Love (1924) This song was composed in 1924 for the musical comedy ‘Lady, Be Good!’, but dropped. Here we have George’s ‘Songbook’ arrangement from 1932. 7 Themes from Concerto in F (1st Movement) (1925) George was commissioned to write his concerto by Walter Damrosch and the New York Symphony Society in 1925. 8 Themes from Concerto in F (2nd Movement) (1925) George recorded a portion of the second movement for his radio programme, broadcast on April 7, 1935. 9 Palm Beach Lullaby (1925) This is based on the song ‘Nightie-Night’ from the 1925 musical, ‘Tip-Toes’, set in Palm Beach. 10 Maybe (1926) This version of the song, from the musical comedy ‘Oh, Kay!’, was recorded by George in New York on November 11, 1926, and meticulously transcribed by Artis Woodhouse. 11 Someone to Watch Over Me (1926) This version of the song, from the musical comedy ‘Oh, Kay!’, was recorded by George on August 11, 1926. I have played it at the more usual leisurely pace at which it was sung. 12 Prelude No 2 (1926) George published his set of three Preludes in 1926. It was this Prelude which introduced me to the music of Gershwin. 13 ‘S Wonderful (1927) This song was composed in 1926 for the musical comedy ‘Funny Face’. Here we have George’s ‘Songbook’ arrangement from 1932; again, one chorus is too short, so I have repeated it. 14 Theme from ‘An American in Paris’ (1928) This is the famous ‘Homesick Blues’ theme. 15 Liza (1929) This song was composed in 1929 for the musical comedy ‘Show Girl’. Here we have George’s ‘Songbook’ arrangement from 1932. 16 Embraceable You (1930) This song was composed in 1930 for the musical comedy ‘Girl Crazy’. This is my own arrangement. 17 Who Cares? (1931) This song was composed in 1931 for the musical comedy ‘Of Thee I Sing’. Here we have George’s ‘Songbook’ arrangement from 1932. 18 Bess, You is My Woman (1935) This beautiful duet was composed in 1935 for George’s ‘folk opera’, ‘Porgy and Bess’. 19 Sleepless Night This melody in fragmentary form appears in a 1924 notebook, but it was composed in 1936 in Beverly Hills. Kay Swift also prepared it to become a song, but, in the end, Ira decided to leave it without words. 20 Walking the Dog (1937) Although George was told not to “bother with the background music” for the Fred Astaire and Ginger Rogers musical film, ‘Shall We Dance’, he replied that he WANTED to bother and composed this piece for a scene on the promenade deck of a ship. It is now one of his most popular pieces. 21 Melody No 40 This is a haunting unpublished melody found among the manuscripts left by George Gershwin. GEORGE GERSHWIN (1898-1937) was a genius. Beginning with popular songs inserted into musical revues, he went on to write scores for musicals, films and full-scale concert works. He had a natural gift for melody, combined with inspired countermelodies and shifting harmonies comparable to those of Chopin, with great enthusiasm for the ‘pep’ and vitality of the jazz age. When coupled with the outstanding lyric writing talents of his brother Ira, they wrote some of the most enduring popular songs of the twentieth century. 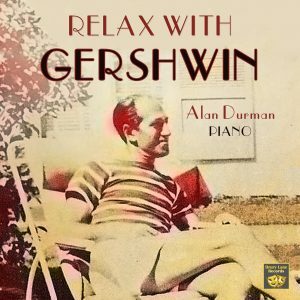 This time, Alan Durman wanted a Gershwin album that was ‘chilled’- suitable for dinner parties or relaxation. So he assembled a list of his favourite quieter Gershwin moments and recorded it on his own record label.